On Aug. 14, 2014, Fresh Cuts Barbershop hosted a free hair cut event for all school age children. The event was sponsored by Representative Perry E. Thurston, Jr., candidate for Florida Attorney General, and Commissioner Ken Thurston of Lauderhill, Fla.
During my visit to the event I had the privilege and opportunity to speak with the owner of Fresh Cuts Barber-shop, Danny Guillaume, who explained to me he was approached by both Comm. Ken Thurston and Rep. Perry E. Thurston last year to host the event. 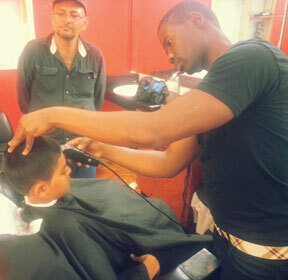 The event was held to provide children with professional hair-cuts before they go back to school. “This was the second year in a row my barbershop served as host to the event and we plan on continuing the tradition next year,” stated Guillaume. Fresh Cuts Barbershop also offers a 50 percent discount to all school age children on Wednesdays, so families who participated in the event can maintain the haircuts given. The event was held at: 1617 N. State Rd 7, Lauderhill, Fla., and consisted of seven professional barbers available between the hours of 9 a.m. to 6 p.m. to cut the hair of any school age child. Based on the smiles I saw on the faces of parents and children attending the event I would say those efforts aren’t in vain.